Home > Equine Causes • Mark Your Calendar!!! > Racing Careers for Women–Because the Horses and the Sport Need Us. I’m going to get the bare facts out there first, so you don’t have to pretend to read this whole thing, just to find the details. So! You decide to blow off work, and hit the track with your best Grrlfriends. Y’all wear PINK, and get in for free. Sounds like fun already, right? Once you get to the famous, gorgeous, elegant, historic track, there’ll be gobs of things for you to do, and in which you may participate! * First, please check out my posting two-posts back, about the Sizzling How Pink Saratoga Hat Luncheon Presented by ESCADA. This event has been raising funds for The Breast Cancer Research Foundation for several years, due to the loving efforts of NYRA’s own Joanne K. Adams. The Luncheon will be a fabulous affair, and you should be there. Please read the previous article that I wrote, just about the event, and contact Joanne ASAP, to reserve your place at the table on Wednesday. Contact: jadams@nyrainc.com / (718) 659-2262. Thanks! Questing, Ouija Board, Personal Ensign, Ruffian, Go for Wand, Questing, Regret, Genuine Risk, Forever Together…you get the drift. The myth that f!llies and mares are somehow weak, or silly little girls is just that…a myth. A 1200-pound animal, running 40 mph, is a mighty Force of Nature, regardless of gender. So be sure to check out the races, themselves, on Fab Fillies’ Day–and watch those F&M races. 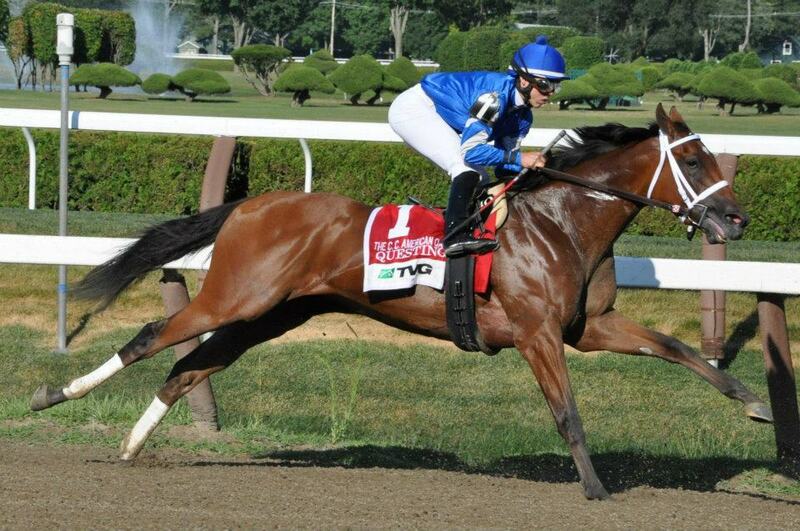 You may see a future Horse of the Year in her Saratoga debut! * So you and your Grrrlfriends ditch work, to hit the track on Wednesday. And you’re all PINK-ed out. And you really hate the thought of going back to work on Thursday. If you hate your job–or you love what you actually do, but wish you could somehow be around horses all the time–let Fabulous Fillies’ Day be the day that you decide to mix it up. To do a paradigm shift. Find your TRUE vocation–your calling, the reason you were put on this blue marble of a planet. You may be an accountant, but you hate driving to Albany every day, parking your car in a white chalk-outlined space, and suffocating in a cubicle, working for someone who doesn’t appreciate you. No fresh air, and everyone makes fun of all the horse calendars on your wall, and racing coffee mug on your desk. Now, step back from this scene and realize that…yes, you’re an accountant. And yes, you’re good, AND you love doing the work, itself. But you can do the work and be around the horses you love, and people who understand your obsession. This is what the Racing Careers for Women booth at Fabulous Fillies’ Day will be all about. Women who work in horse racing in many different jobs will be on-hand at the table–in front of the Silks’ Room, near the Union Avenue entrance to the track–to help you learn about their careers. These women don’t just have jobs–they have vocations. Callings. Reasons to be here. They do what they do best–they use their talents and gifts–they serve the world–and they love what they do, because they work in horse racing. The Racing Careers for Women booth/table plans to introduce you to a jockey; trainer; exercise rider; equine therapist; communications director; ICU Nurse at an equine vet hospital; writer; photographer–virtually every job at a race track or in the horse racing industry–is open to women, and they want you to know about it. 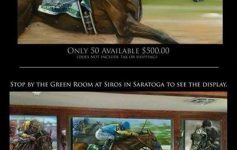 NYRA wants you to know about it–this is why they’re sponsoring the booth. NYRA is acutely aware that women are the majority of the fan base of horse racing–in spite of what some insecure people will argue. NYRA wants women and girls to know that there are jobs and careers and yes, even Life Callings–for females in our sport. 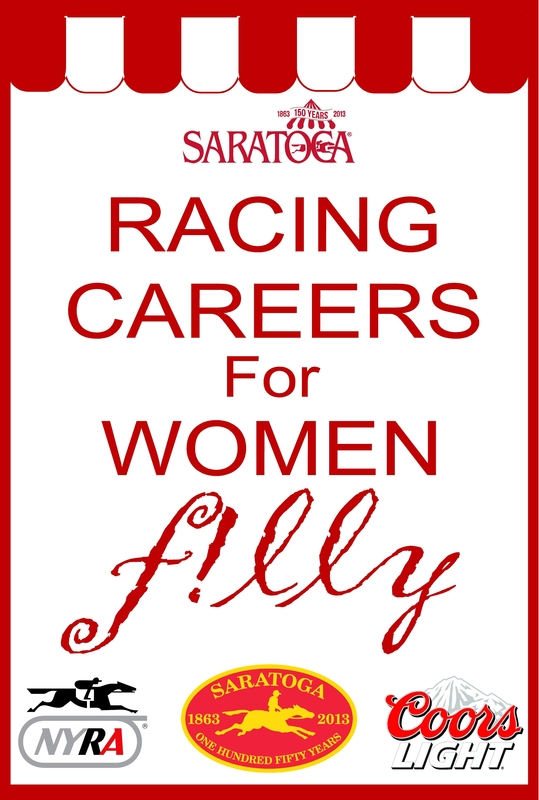 Stop by the Racing Careers for Women booth at Fabulous Fillies’ Day at Saratoga Race Course. You may find that you never again want to ditch work on a Wednesday, because you found out how to put your talents together with your passion. And when you’re there, consider dropping a few shekels into the pretty basket, to benefit Our Mims Retirement Haven. 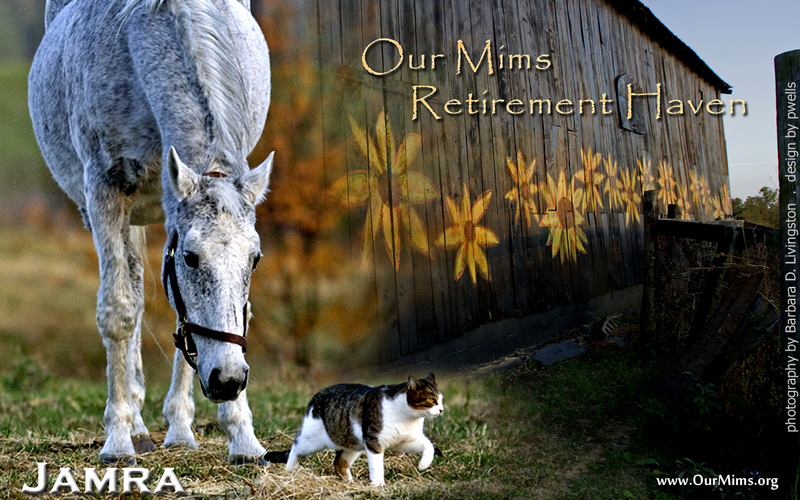 Our Mims is a wonderful, woman-run organization that specializes in restoring health and spirit in aging mares. Isn’t that a noble goal? isn’t that such a f!lly Thing to do–to look out for our beautiful older females, who need us? If you win at the races on Wednesday, you might consider tithing (giving 10% of your earnings) to this profoundly worthy cause. But whatever you can give, please do. Our Mims and the lovely mares will appreciate your loving concern. You may be an accountant in a cubicle today–accountant for a horse trainer tomorrow–and President of NYRA or CDI in 10 years. We womenfolk bring something to the proverbial table–to the sport of horse racing–that many men envy. 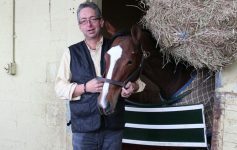 Yes, yes, I know many wonderful men in horse racing, who love and understand horses, deeply and with great compassion. But I’d bet dollars-to-doughnuts that most of those men learned and experienced that love and compassion via their Mothers, and they’d be the first to say so. Horse racing needs us, as fans–most definitely. Yes, we women get angry. Darned angry, when we see animal abuse, neglect and horse slaughter. But it’s not enough for us to express our ire on Facebook–as you’ve read, I’ve written a hundred times that “liking” something means spit. “Liking” something may make US feel better, but it doesn’t do a thing to change bad stuff. The only way for women to positively influence horse racing is for us to BE IN IT. Don’t just “like” it, for God’s Sake–become part of it. Work in the industry–become a Woman of Influence in Horse Racing–raise your voice, your heart and your mind. Find your vocation, and work with us to make this sport as gentle and nurturing for the horses as we can. Do not think that I’m arguing that men can’t be gentle, or nurturing–I am not. But the two sides of the coin–nurturing and defending, at the same time–are part of female DNA. It’s in our souls. “Liking” something never changed a thing. Getting a job that you love in horse racing–using your talents and gifts–and growing as a person even as you help influence the sport to consistently do the right thing for the horses–THAT will make a difference. This is why NYRA wants you to know about the careers that are open to you, to all women and girls who love horses. NYRA knows that more female involvement in horse racing is good for the sport, all the way around. We need female fans, but we also need female equine veterinarians, farriers and yes, Board members of organizations. NYRA knows, now you do, too. Check out the Racing Careers for Women booth on August 14th--Fabulous Fillies’ Day–at Saratoga Race Course. You may meet a woman who, just through the example of her own life–helps change the course of yours. Questing, courtesy of Ronnie Betor. Our Mims (Beautiful Horse and Kitty), courtesy of Our Mims. Previous Article Is Saratoga Race Course the World’s Greatest? Get the Answer on August 13th. Next Article Quaintance House and Backstretch Kitties: the BEST Forty Bucks You’ll Spend this Saratoga Meet.